Like many other stories of the past week, mine begins with this tweet. Natalie Silvanovich and Tavis Ormandy of Google Project Zero found a pretty nasty bug in Microsoft Malware Protection Engine, allowing an attacker to execute arbitrary code as LocalSystem on any Windows computer running any Microsoft anti-malware product such as Security Essentials or Windows Defender by simply having that computer access a malicious file. Attack vectors were abundant, from emailing the file or sending it via any other channel like Skype or Messenger, to having it hosted on a malicious web site or uploading it to an IIS web server. Unlike many other stories of the past week, mine is not about how Natalie and Tavis found this bug, how they reported it to Microsoft or how the fact that they found and reported it was made known to the public. Rather, it is about the bug itself, its root cause, and - of course - about writing a micropatch for it. But first: why would we want to write a micropatch for a vulnerability that would quickly get automatically fixed on all Windows computers anyway? As you may know, Microsoft was super fast in fixing this bug and made an update available literally over the weekend. Furthermore, the Malware Protection Engine is implemented as a dynamic-load library mpengine.dll, and Microsoft designed their anti-malware products smartly enough to not require a computer restart - the old DLL is simply unloaded, and the new one loaded. So why write a micropatch? Well, not every computer gets updated automatically: while automatic application of updates is configured by default, admins can change that if they want to control what gets applied when. And enterprise admins like to have such control, allowing them to test new code before deploying it to computers throughout their organization. Just imagine the updated mpengine.dll having a flaw that prevented users from accessing legitimate files. Another reason for writing this micropatch was to learn, as we haven't patched a security product before - and one can expect to stumble upon something new here (and stumble I did, as you will see). The final reason was to teach, to share some knowledge with those of you who want to analyze vulnerabilities yourselves and learn how to write micropatches. The first step in analyzing a vulnerability is to reproduce its exploitation. The Project Zero report provides a downloadable proof-of-concept file, which has a .zip extension, but is really an HTML-lookalike file that comprises a tiny exploit bit and a lot of random HTML content that makes sure the engine processes the file. Note that I was using mpengine.dll version 1.1.13701.0, which is the last vulnerable version before the fixed 1.1.13704.0. It is always good to do your analysis on the last vulnerable version in order to minimize the difference with the fixed version - you will thank yourself when diffing these versions. With the bug successfully reproduced, the path was clear towards analysis. Here, the Google report was a great start, as Natalie and Tavis have clearly gained substantial understanding of what goes on in the crash case. The most important detail for me was that it was a type confusion error, specifically with some function expecting a string object but getting a number object (which resulted in calling a string vtable function where there really was no vtable). This was important because when a bug is a type confusion error, a typical fix is to add the missing check for the correct type. And such a fix is usually easy to recognize when observing the difference between vulnerable and fixed code. Which brings us to IDA. The image below shows the function that crashed - the exact access violation location was the mov rax, [rcx] instruction (see the red box) at address 0x75A31745A, which is at offset 0x21745a from mpengine.dll's default base address. When a vendor patch is available, diffing the vulnerable and the patched version usually provides useful information and allows you to understand the bug, and the patch, better. Diffing can be a time-consuming operation though first for the computer and then for you, and with large binaries (mpengine.dll is 12MB) you can get a lot of matched functions, and finding where the code logic is different - as opposed to where the code is different - can be somewhat frustrating. So I went on to diff the two versions of mpengine.dll, the vulnerable 1.1.13701.0 and the patched 1.1.13704.0. There were 38440 matched functions, which, in scientific terms, is an awful lot. What I could do with these results was compare the above crashing function between the two versions. If I was lucky, the patch would be there and I could go home early. Now about the call stack: you will notice that I haven't used a debugger up to this point, and the reason is that Windows Defender is a protected service and as such tries very hard to protect itself from tampering. You cannot attach a debugger to a protected process, even if you're a local administrator. And it's not easy to un-protect a protected service either: while its protected status is defined by the LaunchProtected registry value (in our case under HKLM\SYSTEM\CurrentControlSet\Services\WinDefend), you cannot change that value for Windows Defender while Windows Defender is running as it prevents you from "attacking" it. The top one we already know - it's the access violation location in the crashing function that we diffed just moments ago. So I proceeded with the second address, FreeSigFiles+0x12046f, and located it in IDA. It was, as expected, after a call to the crashing function. I then took the address of the function containing that address, and viewed the diff with its patched version. This is clearly the patch I was looking for. It was simple, it did exactly what I was expecting it to do, and it was in the code path of our crash. My goal at this point was to create a micropatch that would inject the same patch logic into the vulnerable version of mpengine.dll. In a perfect world, I could use literally the same code that I found in the patched version, and inject it in the same place - but in this world a compiler likes to use different registers and different implementation of the same logic in two subsequent builds. So I had to re-implement the patch logic from the original patch. Let's look at the vulnerable function in IDA. The above image shows the vulnerable function and a good location for injecting our code. The location is selected so that it allows us to jump from our patchlet code directly to the function epilogue (the lowest block of code). cmp eax, 4 ; is the object of type string? call PIT_ExploitBlocked ; Show "Exploit attempt blocked"
What this single-patchlet patch, inserted at the shown point in code, does is - just as the original patch - call GetTypeOf on the object (whose address is in register r9) and see if its type code is 4 (string). If it is, it continues execution of original code where it was injected . Otherwise, it sets the return code (register al) to 0 and jumps to function epilogue. Note that in order to avoid any negative side effects, I had to (1) review the GetTypeOf function to see which registers it may taint and whether that could impact the code after our injected patch (it taints rdx and rcx, but rdx holds nothing valuable at our injection point), and then (2) store rcx on the stack before calling GetTypeOf function because rcx holds some value that is still being used after our injected patch. I also wrote the same patch for the last vulnerable 32-bit version of mpengine.dll. If you have 0patch Agent installed, patches ZP-271 and ZP-272 should already be downloaded to your computer, waiting for any occurrence of the vulnerable mpengine.dll getting loaded. To restore the original system configuration, I turned Windows Defender back to a protected service, and... shoot, the patch stopped getting applied. It quickly became clear that we can't inject our loader into the protected Windows Defender because only binaries signed by Microsoft are allowed to get loaded. (It's a bit more complex than that but close enough.) This is Windows Defender protecting itself against local malware - even with admin privileges - trying to compromise it. So while we're exploring options for extending our reach towards patching protected services, patches ZP-271 and ZP-272 for Malware Protection Engine will only get applied on Windows 7 and Windows Vista, which don't have protected services. A 32-bit or 64-bit Windows 7 computer running Windows Defender. While you could also do the testing on newer Windows versions, you would have to un-protect the Windows Defender service in order to proceed. First of all, stop the Windows Defender service via elevated Services console. Then browse to C:\ProgramData\Microsoft\Windows Defender (folder permissions don't originally allow you to open it so Windows will ask you for elevation, after which it will add your account to the folder ACL). Open folder Definition Updates, and notice one or more subfolders with GUID-like names starting with curly braces. Open each of these folders to find the one containing mpengine.dll. Rename the existing mpengine.dll into something else, then save the vulnerable mpengine.dll there. Start the Windows Defender service. Download the proof-of-concept file and store it in some empty temporary folder. 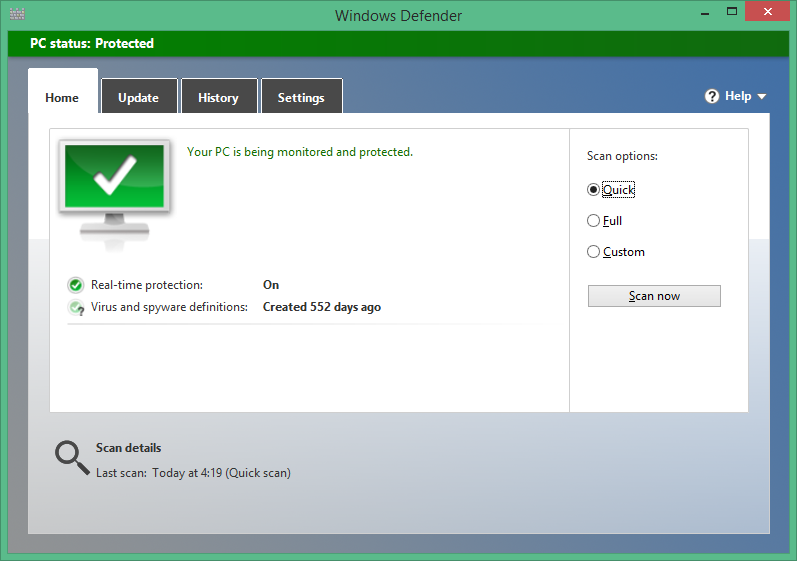 Launch the Windows Defender console via the Control Panel, and Custom-Scan the above folder. 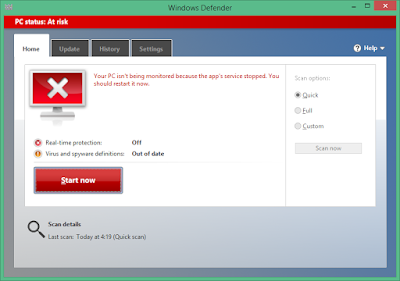 Notice that Windows Defender service crashes. Now install 0patch Agent on the computer. If you don't already have it, download a free copy and register it with your free 0patch account. Finally, restart the Windows Defender service and re-scan the temporary folder. This time, you'll see an "Exploit Attempt Blocked" popup instead of Windows Defender crashing. If you want to build our patches yourself, you can download their source code and build them using 0patch Agent for Developers. While this vulnerability has already been automatically fixed on most computers, it turned out to be an interesting learning experience to micropatch it. I hope this post will help future micropatchers jump-start their research. While I was writing this post, the world got pierced by the WannaCry ransomware worm exploiting a known vulnerability that had an official patch available for Windows operating systems which Microsoft supported at the time. Many hospitals and other critical infrastructure components were taken offline, partly also because they were stuck with unsupported OSs such as Windows XP. They have very rational and complex reasons for being on such outdated systems in 2017, and undoubtedly they will have similar reasons next year and the year after. One of our goals with 0patch is to provide protection for such end-of-support systems while users scramble to update them (and have the same problem almost immediately afterwards). Defending against modern attackers will require rapid response, and this exercise with CVE-2017-0290 - although likely of low value to users - was an example of building up skills and speed. The world will need a lot of 3rd-party patch developers though, so all existing and prospective security researchers are warmly welcome to join us. Great entry! My third year uni project is to actually make a disassembler using capstone. I don't have the greatest experience with disassembly, but reading things like this really sparks some interest! Thanks for a good read. You're welcome! I know the future generation of patch developers needs resources to learn and get inspired, and I'm happy to be a tiny enabler here.